The delicious taste of authentic Liege waffles takes great dedication and time when made from scratch. For those looking to a simpler and quicker way, we have just the solution. Our team has been in development for months to create a foolproof way to simplify the process from ingredients to fantastic waffles. Food scientists and experts were consulted. We spent countless hours in the test kitchen. Unknowable sums of waffles were baked and consumed all in the name of creating the perfect formula. Making fresh and beautiful Liege waffles is now easier than ever with the help of Waffle Pantry’s Liege Waffle Mix. 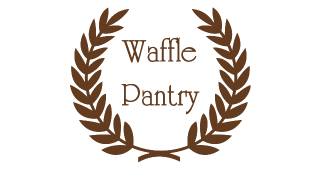 Every package of Waffle Pantry Liege waffle mix is accompanied by Waffle Pantry’s Belgian pearl sugar and Lesaffre SAF Gold Instant Yeast. These three key ingredients are packaged separately to ensure absolute freshness and are only combined by you when you’re ready to bake. The only thing you need from your kitchen is hot water, butter, and eggs to bring the mix to life. Preparation time is only 15 to 20 minutes. Proofing time is for the Liege waffle dough is about 2 to 3 hours, which is ample time for the yeast to activate. Our 32 ounce Liege waffle mix package provides enough ingredients to serve 18 waffles (each 100 g or 3.5 oz in size) while the 55 pound bag will make you 500 waffles..
For all of our food service and business customers, don’t hesitate to contact us for more information about our Liege waffle mix wholesale program. Let us formulate and source the best ingredients for you and help you achieve a consistent and authentic result while you focus on your business. Total Mix Yield (32 oz) = 18 Waffles (each 100 g or 3.5 oz) Change measurements proportionally as necessary. Combine softened butter and hot water in mixer. Add waffle mix, egg and yeast. Stir well. Knead to form sticky dough. Cover dough and let rest for 2 to 3 hours. Gently fold Belgian pearl sugar into dough. Divide dough into 12 portions. Cover and allow dough to rest for 15 minutes. Preheat Liege waffle iron (360°F or 182°C). Flatt dough balls slightly and place on the iron. Bake for 2 to 4 minutes until golden. Enjoy! From Our Pantry to Yours! Will you be packaging this in smaller quanities? Not sure my family would ever go thru 500 waffles before product would expire. Hi Ginger, thank you for your question. We have a smaller package in the works but it may be some time before it becomes available. In the meantime, please know that the mix has a shelf life of 6 months and can be divvied up to share with friends and family. To use this mix in a business setting, would it work to refrigerate the dough over-night, after it has gone through it’s first rise?, then in the morning add pearl sugar and the second rise before cooking?. Yes, you can refrigerate dough after the first rise. We recommend releasing some of the air out of the dough before placing it in the fridge. When you’re ready to bake, remove the dough from the fridge and allow the dough to come to room temperature. Once the temperature is correct, fold in pearl sugar and bake as you wish. Do let us know if you have any additional questions. Happy baking! May I know what type of butter is good Unsalted butter or salted butter for this mixture. Hi Francis, we suggest using unsalted butter.